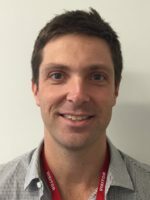 Matthew is a Technical & Commercial Analyst for GE Oil & Gas located in Perth. His role involves extensive interaction with the broader oil and gas industry including LNG projects and processes across Asia Pacific. A former UWA graduate with an honours degree in Chemistry, Matthew has over ten years’ experience in the oil & gas industry. He has held various technical and commercial roles as well as a number of years as a manager of business operations for a global oil field chemical company in the Middle East and Asia Pacific Region. Matthew holds an MBA and has strengths in business development and project planning and execution.